The company which manufactured Aristo calculators was Dennert & Pape, founded in 1862 by Mr. Johann Christian Dennert in Hamburg, Germany, and initially produced geodetic instruments. In 1872 the company became the first manufacturer of slide-rules because the war with France had reduced the number of slide-rules that could be imported. It was the first manufacturer of slide-rules in Germany. In 1936 the company started to manufacture slide-rules from a dimensionally stable plastic called "Astralon" rather than mahogany laminated with celluloid number-scales. At the same time these slide-rules were sold under the new trademark "Aristo". With the appearance of electronic calculators in the late 1960s-early 1970s, especially the Hewlett-Packard HP-35, sales of slide-rules dropped dramatically, so Aristo started to manufacture electronic calculators themselves. Two of the target audiences were teachers and their pupils because Aristo had contacts in the school authorities from their slide-rule activities. Alas, they were not successful enough so that in 1979 the company was dissolved by Hans Dennert, the great-grandson of the founder. Aristo produced a series of electronic hand-held calculators, many with a very distinctive styling, as shown below. 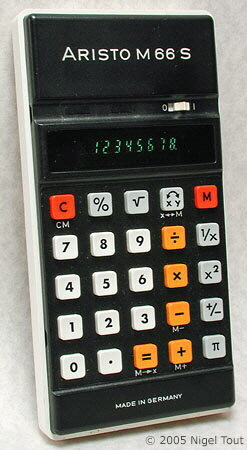 A slim, fairly basic, hand-held electronic calculator with LED display, dating from about 1973. There is more information about this calculator in the Featured Hand-held Electronic Calculators section of this site. A later model with greater functionality and a VFD (Vacuum Fluorescent Display), but still with the same styling, from about 1977. For more photographs of Aristo calculators see the Calculator Photo Library on this site.